A top commander of the AGC was arrested on Sunday days after the paramilitary group said it was considering a surrender to justice. 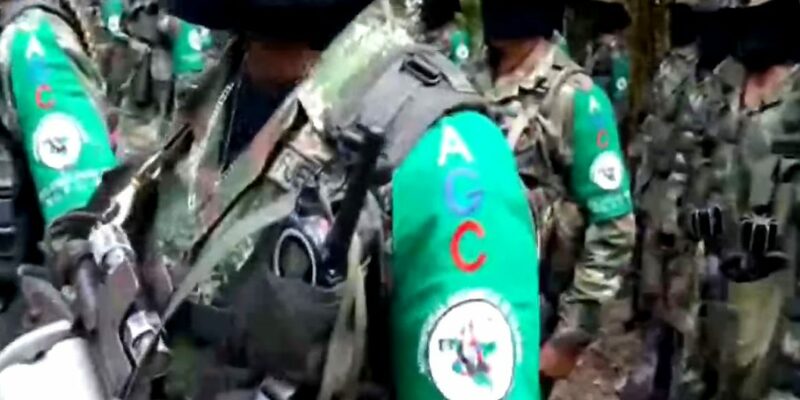 “Nicolas,” a member of the central command of the group also known as the “Gulf Clan” took place in the town of San Rafael, some 35 miles east of Medellin, Antioquia. Nicolas had been with the AGC since its leaders abandoned the demobilization process of paramilitary umbrella group AUC. The commander is one of the members of the central command that is led by former AUC member “Otoniel,” who has been leading the group since the arrest of founder “Don Mario” in 2009. The United States’ government has accused the group of being Colombia’s largest drug trafficking organization. The Prosecutor General’s Office said on Twitter that Nicolas was charged with conspiracy, terrorism, homicide and threat in Medellin on Sunday. The group last week denied “information given by the media according to who there will be an immediate surrender” in response to after the president’s ratification of a law that would allow the collective surrender and prosecution of large illegal armed groups. We believe that it is very positive that legal solutions have been sought for the groups that remain in the conflict, a fact that we appreciate and value. We are explaining the law within our political and armed structure, and once we have finished with this process, we will proceed to take the relevant decisions together. Nicolas will not be able to enjoy the legal benefits of the AGC’s possible collective surrender the group has requested since September last year. The AUC successor group is one of several groups that have terrorized rural Colombians in areas where the state has traditionally been negligent and effectively non-existent.